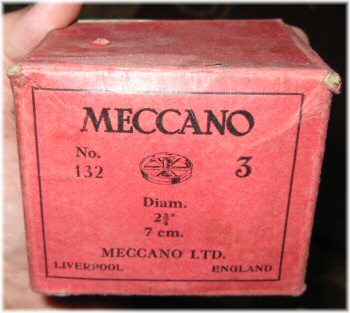 The Flywheel is mentioned in the March 1921 edition of the Meccano Magazine, as a suggestion from a reader, and the reply states that "we propose introducing one at the earliest opportunity". Sure enough, it appears in the September 1921 issue, along with many other new parts. It was included in the new outfit 7 in 1922, and continued into outfit L and (many people forget) was also included in the pre-war outfit 10. It was never reintroduced after the war. Cast in lead with a long brass boss incorporating a small pulley section, the flywheel does its job surprisingly well for such a small part. The weight, at around 140g (5 ounces), is mostly concentrated around the rim. The rim itself has a central groove with indentations to help grip a cord, presumably. The comments below mention that the flywheel is much too hard to be made from pure lead, and the blueprints confirm this. Now that we have them, we can see that the wheel is specified as 86.75% lead, 13% antimony, and 0.25% tin. This makes for an extremely hard lead alloy. Although it was shown as being in the (non-existent) outfit 10 immediately post-war, it had disappeared from the outfit contents listings by 1949 when outfit 10 was reintroduced. Along with many other pre-war parts, it still appeared in the illustrated parts lists until 1952, but it is not thought that this part was manufactured post-war. The most significant changes in the flywheel, apart from the change to double tapping presumably somewhere around 1928/29, is the colour. The parts were originally painted black, then were blue for a short time, then red. DMS/EMP shows these changes as being both within the 1934-1935 period of lettered outfits, but it was almost certainly matching the other blue parts during 1932-33, then changed to red in 1934 with the start of the lettered outfits, along with most other parts. DMS/EMP doesn't mention single and double tapping, although it shows in the diagrams along with a supposed change in the thickness of the rim from 17/32" (13.5mm) to 31/64" (12.3mm), which seem to be arbitrarily assigned fractional measurements. 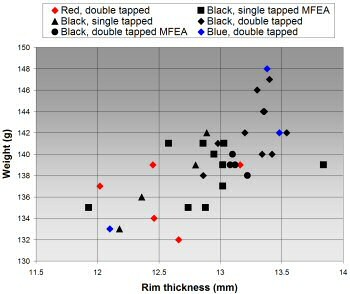 I don't believe that this rim thickness change is valid – examined parts have a range of rim thicknesses consistent with a cast lead part being milled to produce a smooth even rim. 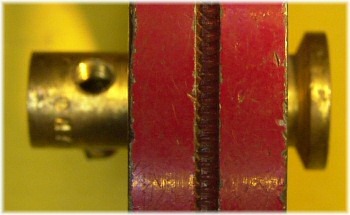 The thickness of most parts is between 12.4 and 13.4mm. The scatter graph to the right shows the parts examined to date, and so far looks to be almost completely random. This shows clearly that there aren't two distinct widths of the flywheel, nor is there any significant relationship between dates/styles of flywheel and widths or weights. The only thing we can see is a slight correlation between width and weight, as you might imagine. The obvious oddity here is the mention of the boss changing in length. The diagram of the wheel shows the central boss section of the wheel doubling in size from 3/16'' to 3/8''. However, this change is dated May 1949. The newly introduced Outfit 10 immediately after this date no longer contains the flywheel, and it is not thought that the flywheel was subsequently available. So this seems to be a drawing of a part that doesn't exist. Certainly I've never seen a flywheel with a thicker boss section as shown on this drawing, have you? 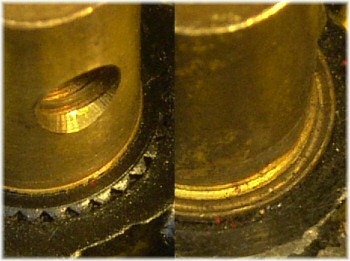 The other change that I can see is that I have just one example of the flywheel with a boss where the serrations in the boss are visible (left-hand example in this picture). All others have a very slight peened-over end holding the flywheel in the boss. Sadly, the serrated example I have is repainted, but the picture shows the difference. Is this an example with the peened part broken off, or are there more like this? Until we find more, this is not shown as a separate version in the table below. Total number of messages on this page: 7. This is page 2 of 2.